Camouflage, suits uniform camouflage (winter, summer). Tailoring of a uniform, tailoring of camouflage clothes. To order. From own material and from the customer's material. Quickly, qualitatively. 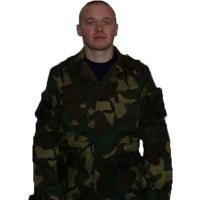 Unbelievable price on Clothing camouflage, camo in Ivanchi (Ukraine) company Predpriyatie gosudarstvennoj kriminalno-ispolnitelnoj sluzhby Ukrainy (№76), GP. Wide choice of quality products at affordable prices.